If you hesitate to take your child trick or treating due to allergies, Celiac, sugar consumption, or dyes, I have something fun to share with you! If your child is new to his/her eating lifestyle and has a hard time giving up the goods, you’re gonna love this! 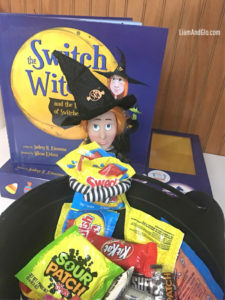 Switch Witch is the allergy friendly Halloween tradition. Wanna see? She’s a small, orange-haired doll and is a girl after my own heart, with an affinity for stripes. She comes in a sturdy, box adorned in candy graphics bearing the Teal Pumpkin Project trademark for Food Allergy Research and Education. 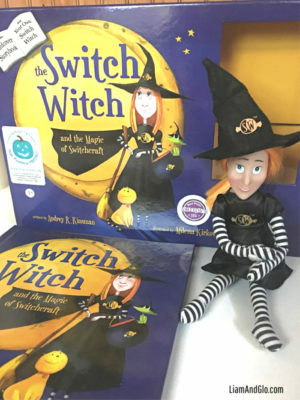 Inside the box is a biography of Switch Witch. The story describes who she is, what she does, and why she needs your kidlet’s unwanted candy in 20 brightly colored, detailed pages. Although the story describes switching candy for a toy, you can alter that and switch unwanted candy for “safe” candy. 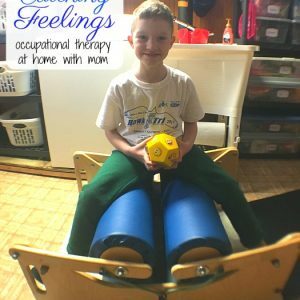 I’m curious if you or your kidlets have limitations. Let me know in the comments section. The candy acquired on and before Halloween night will get switched for safe candy, not a toy. Instead of it magically disappearing, we will take our treats to a local dentist who participates in the Halloween Candy Buyback program and sends all the goodies to our troops overseas. Candy is weighed on a scale and each child is given $1 per pound. Fun, right? I love this so much! Learn more about Halloween Buy Back and find a program in your area. What’s the point of Switch Witch if we send it overseas instead of pretending she needs it to warm her bath water? 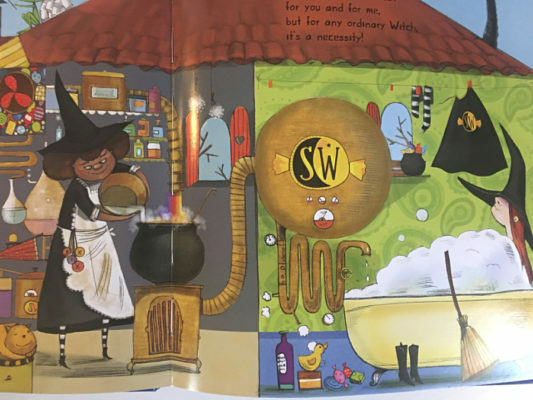 Although Liam is impressively mindful of his gluten-free diet, Switch Witch brings tradition and giving to Halloween along with a new take on the secret life of witches. 😉 We are both pretty new to our gluten-free lifestyle and this is Liam’s first GF Halloween. She’s a fun, tangible reminder of his responsibility to make his health a priority over wants. As you can see, the cauldron is nearly full and we aren’t to Halloween yet. If you saw his reaction to Switch Witch in my Instagram stories, you know how excited he is about it. He’s eagerly sifted through his candy, readily giving up nearly everything besides Tootsie Rolls and Starburts. He’s loving watching the cauldron get full and asking to weigh in with each addition. What are your limitations and tips for allergy-friendly trick or treating?